In their first program of the new year, Ludovic Morlot, the Seattle Symphony and guests offer an inspired pairing of Beethoven’s immortal Ninth and the spiritually attuned music of Olivier Messiaen. It doesn’t matter how familiar the music is. 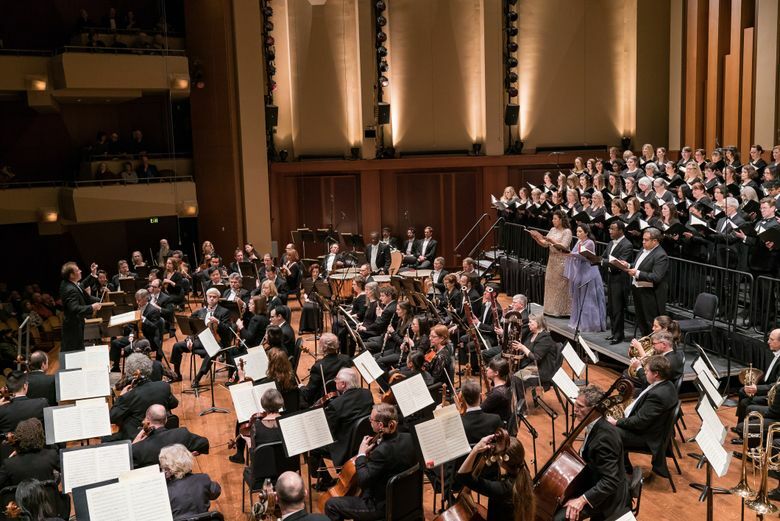 When performed with skill, imagination and, above all, conviction — as the Seattle Symphony and Chorale led by Ludovic Morlot did Thursday night — Beethoven’s Ninth transports and transforms. And the piece that was likely unfamiliar to many in the audience, Olivier Messiaen’s “Trois petites liturgies de la Présence Divine” (“Three Small Liturgies of the Divine Presence”), proved to be an inspired choice to pair with Beethoven’s last symphony. Repeats 8 p.m. Saturday, 2 p.m. Sunday (Jan. 7-8), Benaroya Hall, Seattle; tickets from $28 (206-215-4747 or seattlesymphony.org). Finding a work suitable to open with when the main course is the Ninth must rank among the most challenging puzzles in orchestral programming. Rather than opt for an inevitably forgettable hors d’oeuvre, Morlot boldly juxtaposed a substantial composition by his compatriot, one of the towering musical minds of the last century. Composed during World War II, Messiaen’s “Trois petites liturgies” dates from early in his career. It celebrates his ecstatic Catholic faith in settings of three poems by Messiaen himself. They convey his perception of the sacred in imagery shot through with a sense of mystical rapture and enthrallment. The work’s premiere in 1945 reversed the usual 20th-century picture of a “scandal”: this time the public loved a piece of radically original music while the critics voiced outrage and embarrassment at the expression of unabashed spirituality. Messiaen’s scoring for an unusual mix of string orchestra, keyboards, percussion and women’s choir enhances the wonderful weirdness of his sound world — like a celestial gamelan — which manages somehow to be simultaneously transcendent and sensual. In the prominent solo piano part, Michael Brown dispatched Messiaen’s complex rhythms incisively. Adding a sense of giddy joy to the texture were the swoops and whistles from the ondes Martenot, played by Cynthia Millar, a renowned virtuosa of this thereminlike electronic keyboard instrument invented in the 1920s. Before Morlot came onstage, a brief video introduction to the piece was shown in which the conductor explained his decision to substitute the childlike tone of a boychoir for the women’s voices called for in Messiaen’s original score. The Northwest Boychoir sang with miraculously pure intonation and impressive diction. It provided an intriguing counterpart to the massed adult chorus to be heard in the Beethoven at the culmination of the evening. “Trois petites liturgies” lasts more than a half-hour, and Morlot made its themes of a divine cosmic resonance spellbinding. He drew out Messiaen’s potent contrasts of meter-defying melody and hectic rhythmic activity, of wild wonder and blissful contemplation. A very different cosmos might have come into view with a more old-fashioned reading of Beethoven’s Ninth. But rather than the heavy-handed monumentality favored by so many accounts several decades ago — which exaggerate the “majestic” in the composer’s directive “un poco maestoso” — Morlot elicited a revelatory transparency of texture in the first movement. It illuminated many a fresh angle in Beethoven’s transformation of his material. For the big picture, Morlot tautened the massive climax at the beginning of the recapitulation, bringing home the shocking shift of the symphony’s axis, where the turn to the major key brings terror rather than affirmation. Timpanist Michael Crusoe, who recently made his welcome return to the SSO, thundered powerfully, in a preview of the prominent role his instrument plays in the ensuing movement. The conductor’s subtly elastic pulse intensified a sense of anxious suspense — to marvelous effect in the first movement’s drawn-out coda. Some split-second misalignments robbed the Scherzo of the tension that had been built up, but I welcomed the warmth that blossomed in the trio, like a vista of the promised land to come in the finale. The SSO’s playing in the slow movement alone would have been worth the price of admission. Beethoven’s melodic dimension — so undervalued — inspired Morlot and the orchestra to wonders of sustained legato and euphonious phrasing. This movement also found the conductor making his least-conventional tempo choices as he guided the interspersed Adagio and Andante sections in a briskly choreographed flow that nevertheless didn’t feel rushed. Aside from a disappointingly tepid rendition of the Judgment Day dissonance (the “horror fanfare”) that launches the finale, the movement containing the Ninth’s most beloved music teemed with all the variety and sense of purpose a music lover could wish for. Conductor Joseph Crnko, who had prepared the Northwest Boychoir so flawlessly, had the Seattle Symphony Chorale master Beethoven’s unwieldy demands with astonishing control and balance — and such cleanly sustained high As from the sopranos. Less satisfying was the quartet of soloists. Bass Jonathan Lemalu, the first human voice to be heard in the Ninth, sounded underpowered and unfocused, and mezzo Rinat Shaham’s beautiful timbre remained mostly submerged in the sea of sound. Soprano Mary Elizabeth Williams and tenor Kenneth Tarver carried the day with their powerful and richly expressive instruments. Two more performances remain, on Saturday and Sunday. Good luck finding tickets, but if you succeed, you’ll be rewarded.